My family and I went on a hike in one of my favorite parks ever. Seattle is gorgeous in an unfair sort of way (unless you’re from there) and there is one park in particular that will convince you you’re three hours away from a bustling city. Discovery Park begins up on the cliffs of the Puget Sound with tall grassy rolling fields coming right up to the edge of the vistas and then provides trails taking you a couple hundred feet down to a gorgeous beach front with a lighthouse. 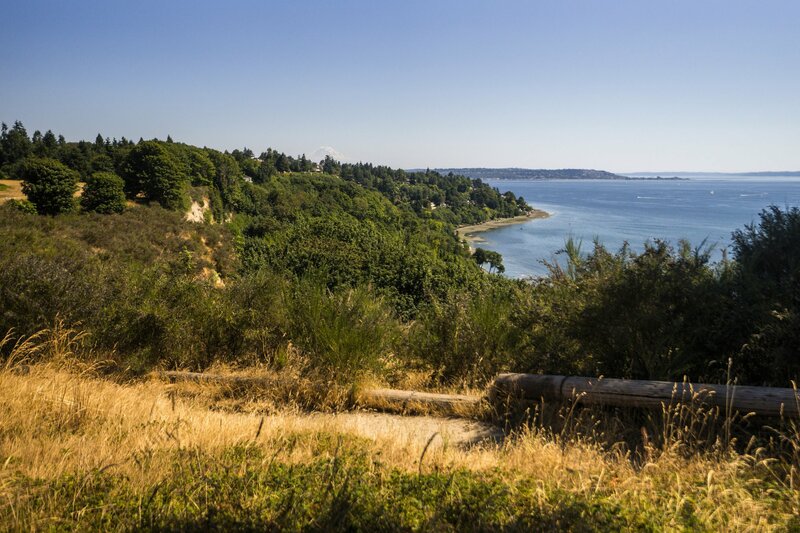 As we began our hike through the hilltop prairies, touching the brown grass with our finger tips as we walked the skinny dusted trails, we began to see the edge of the cliffs ahead of us and the gorgeous Puget Sound far below. We all carried pieces of our picnic. I chose a spot next to the cliffs that didn’t terrify me but still had the best view possible. I made a couple of motherly comments about how I couldn’t believe how steep the drop off was and how dangerously unsafe it was and in between laughter and stories, I spent the next hour barking gasp-filled warnings at anyone who moved an inch from where their buns had been planted on our picnic blanket. We got up to go on down to the lighthouse. And that’s when I saw them. Lain perfectly in front of the next opening to a vista was a flattened bouquet of white roses. They were not thrown. Or dropped. They were lain perfectly. And flattened. Or perhaps they had been sitting there a day already and the life had come out of the blooms so that they began to sink back into the earth, no more vibrance filling the petals to make them full any longer. I was completely taken. What was this sight. What had happened here. Were the flowers given here? Was love rejected here? Was someone remembered here? Did someone lose their life here? Was something enjoyed but then left for someone to come find it? The way the flowers lay, the way they were still gathered, the purity in their whiteness, the spot where they were left, high up on the cliff above a far reaching depth below. All of it meant something. And I wished I knew the story. But I won’t know this story. And the evidences of it came and went. We come across these stories all the time. The stories that may not be told. But they are right there, if we just look to see the signs of them. The out of place signs. A straight face when there should have been a smile. A shrinking away when there should have been participation. A murmur instead of an audible response. A looking away instead of a looking forward. A hesitation instead of a step. An absence instead of a presence. We all carry our white cliff bouquets. Our out of place signs. Our indications of ways that we are out of place because of some heartache, some event, some sadness, some dilemma, some befalling, some secret, some affection, some confusion. And it might not be obvious what they mean and it might remain a mystery and sometimes we’re more obvious about it than others. But regardless, when it’s really a white cliff bouquet moment, with a real story churning behind it, it’s hard to conceal because the story is so obvious in our greater narrative. I think I felt a little out of place myself, finding the story laying there. I thought, am I supposed to be here? Am I interrupting something? Is something wrong? What am I supposed to do with this? But that was just me inserting myself awkwardly into someone else’s bigger true life happenings and that’s a mistake. When we encounter someone else’s story and our focus is on our response, then we’re just awkwardly going to botch the brush with rawness by either trying to escape connection to it or by feeling to obligated to be a part of the rescue. It’s not our story and our role is minute. Though we often think so highly of ourselves. I won’t know the whole story of those roses. I’ll never really understand and it will remain a mystery beyond my own life. But still I did find them and encounter their out of place-ness. Just as I will encounter the enigmatic bouts of mankind, sensing the struggle on a face or in a moment, and without an invitation further, they will be gone. These white cliff bouquets deserve our curiosity in a kind, respectful way, as one notices a hurt with nurture and with human dignity, even if we can do nothing and we’re not asked to do something. We’re not superheroes and we’re not here to save anyone. We’re not gods and we’re not saviors. Sometimes we see the smallest glint of a story and the best thing we may have to offer is to stand, to wonder them with tenderness and a compassion for what one must be living out in there real life narrative, and then all we can do is to continue on. Hopefully with a deepened concern for humanity. A willingness to know the story should it be offered. And an acknowledgement that this realm of humanity is bursting with suffering, struggle, confusion and we must keep our hearts soft for one another because no one knows anyone else’s white cliff bouquets. Even if we have an idea, we really have no idea. Kelly Christian is ever reckoning life through wonder and conversations, always wishful for the next chance to put everything that means anything into type. Her heart is riveted by faith, questions, beauty, creation, identity, and sparks in conversations with strangers and friends alike. Kelly resides in Charlotte, North Carolina where she writes nonfiction, teaches English as a second language, and enjoys loving on her four little dignified souls alongside her husband. You can find her on Facebook and Instagram.